American Aldes IQ-VFC is an intelligent ERV-integrated vertical fan coil for high-rise apartments, condominiums, and hotels. 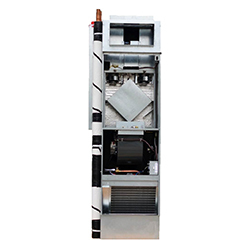 The IQ-VFC takes all the benefits of a standard vertical fan coil and builds in the energy-efficient ventilation of an Energy Recovery Ventilator (ERV). The result is a heating, cooling, and ventilation solution that works smarter, saves space, and reduces costs.